When I first started cutting I was as impatient when making art as I was in the rest of my life – with everything. I cut almost everything freehand (no drawing beforehand- maybe a sketch), and having little experience with artistic exactness, most of my work remained “works in progress” for years. I wasn’t happy with them, I couldn’t figure out how to finish them, etc. Eventually I realized I needed to take the time to complete my drawings before I touched the knife. It’s still not a perfect science for me, I tend to draw like I take notes: that’ll be enough, I’ll get what I meant once I get back. No. I’ve started to play around with drawing with pen so my pencil doesn’t smear, drawing with colored pencils so the nuances of the sketch are clear, and more recently, drawing with crayon because the wax helps to protect the paper and make it TINY bit stronger. Yes, always, definitely, without a doubt. This Wednesday, October 25, I will be planting myself on the 2nd floor of the Gladwyne Library taking orders for custom silhouettes. Have a kid? Grandkid? Niece? Nephew? Friend? NEIGHBOR? BOSS? Up your gift game this year but giving the gift of the traditional silhouette (or the traditional silhouette with a twist). Skip the ihome that you found at Costco (no one is into that stuff anymore). Monogrammed robe from Restoration Hardware? I know they are the softest, but really, is Grandpa Joe going to wear it? You know that friend you’ve maybe, kinda, sorta neglected since they spawned? Show you still care with a custom cutting of their sweet, little angel! Visit on Wednesday and 20% of your purchase will benefit the Gladwyne Library – that’s an amazing gift, supporting local art, AND a charitable donation to a library. How can you go wrong? Also, all orders placed Wednesday have a guaranteed turn-around time before or by the December 2017 holidays. I will NOT be cutting the silhouettes live, because performance art is not my bag. I spent five years as a face painter and vowed never create art live again- on someone’s face or of someone’s face. I will be taking a photo, chatting with you about options, so it’s important you bring with you the person you need a photo of. If you can’t bring them, just place the order with me and I will contact you to get the photo at a later date. Sweet Mabel is cool shop in a cool town, and I think I am one of the only people on the main line that hadn’t visited until this year. For people that mentioned the shop to me (about 25), I think it must have been like quoting The Princess Bride or Labyrinth and hearing, “Never watched it.” Madness! Tracy and Dave are as cool as their little shop, …and creative …and laid back, and I’m not just saying that because for the first time ever I didn’t have to hang my own pieces (and stress about how they are ordered). Thank you, Dave, thank you… Do you “freelance hang”? If you’re in Narberth, stop by Sweet Mabel and buy all the things, because you will want to and life is short. Also, you can’t take it with you, and you only live once, and all the cliches. If you think about it, shopping is the hunting and gathering of our time. If you’ve never heard of Narberth – gasp – go there today. Have some cheese, see a film, watch the crossing guard do her thing, buy a book from a real bookstore, go to Sweet Mabel and buy gifts for everyone (and yourself), go to the little market, smell the hardware store (even better than “library smell”), buy some wine and hop a train home (unless you drove, then don’t). Also, take a look at the paper cutting on display, because it’s mine and I made it with love, which I think is the theme for one of the coolest towns on the main line. When I was in school at Gladwyne Elementary, I entered a drawing of Marvel’s (X-Men) Wolverine in the Gladwyne Library League’s Annual Art & Craft Show and won a blue ribbon. I don’t want to say it was the highlight of my childhood, but it felt fabulous. I took a decade and half off, but began entering my pieces in Library show around 2011 and found it was just as delightful to partake in as an adult as it was when I was a kid. Recently, the little library in Gladwyne was renovated to allow for an elevator to the second floor, and I decided to “cut the library” as a gift upon their grand reopening. Spending more time at the library, enjoying the volunteers, board members, employees, and community friends, I started to understand why the library is referred to as the “heart of the village.” I also reflected on how the annual art show seems to bring so many of these great people together. Gladwyne is a cute town, but there isn’t a hopping cultural or social scene, for that you typically venture towards the beaten path of Lancaster Avenue. Shortly thereafter I emailed the folks at the library and asked if they would consider hosting me for a solo exhibition in their 2nd floor space (just a short elevator ride up), and to open up the conversation about having a greater art presence right in the heart of Gladwyne. I proposed, they said yes, and I guess that makes me and the library like Ray Kinsella and his tractor from Field of Dreams: if we call the artists, they will come! And I got to go first! So here is a sampling of the 80 pieces that I hung at the Gladwyne Library on September 15. They will remain for your viewing pleasure until October 27. Through a family connection (thanks mom), I had the opportunity to contribute to a large piece to be displayed in the Hilton Hotel at Penn’s Landing. The location of the piece within the hotel is less important (near the head), than the fantastic way that it turned out. For a such a success, it’s surprising it started the way most fiascoes kick-off; with my mom asking, “Hi! Can I commission something from you?” It might sound odd that such a question would elicit a negative response, but usually the request is something unusual, and somehow “working” for my mom immediately reminds me of being a teenager; it’s like hearing, “I need to talk to you,” as soon as you get home from school. But it worked out, in large part due to her having the base art completed before my part began. Overthinking and over-planning are my two worst enemies. She asked me to cut the Statue of Liberty, poor gal (she’s feelin’ it right now), based on a simple photograph. She had already laid out a black background with torn strips of red, white, and blue, so all I had to do was design Lady Liberty out of yellow (goldenrod?) Canson paper and cut to fit. That was it! I sketched it up, drew it out, cut it out, laid it down. No drama. It looks fantastic. If you look closely you’ll see something very unusual for my work – she is in three pieces. It’s very rare for my cuttings not to be one piece, but in this case, I wanted to be able to re-position her as-needed to fit the tall and narrow frame. For the month of July (until the first weekend in August) I have the pleasure of showing at the Gryphon Cafe with two other artists. Within a day of taking down this show, I will be bringing the pieces to the Athenaeum in Philadelphia to be scanned, at which point I’ll have some high quality photos to share. For now, please enjoy some snapshots in my signature style: rushed, blurry, and crooked. A few familiar favorites, an assortment of throwbacks, and some of my newest work. Stayed tuned for up-to-date pictures (mid August). 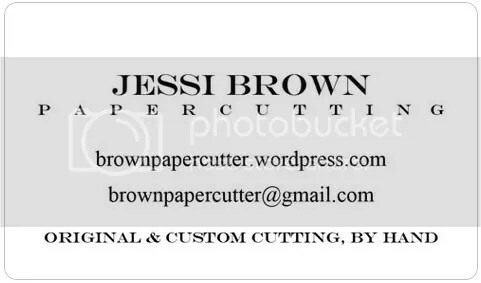 I have two Instagram accounts: @brownpapercutter and @lovelylucybrown. One for my artwork because not having one isn’t an option, and one for my dog because I only have one foot in the millennial pool and I also have an irrational fear that the thousands of pictures I take of my dog, Lucy, will somehow disappear. On varying levels, some much more natural and reasonable, I assume this is how most pet owners feel about their fur babies, so I was very excited when the Gladwyne Animal Hospital accepted my proposal to hang pet portraits in their waiting and exam rooms. These pieces will be rotating as I produce new work, and will of course be available for sale – commissions welcomed and accepted! The pet portraits below are not hanging in the animal hospital, but I couldn’t leave ’em out… cute ‘lil guys. Until my second show at Waverly Heights, I had never realized that it is standard procedure for many artists to frame their work generically or inexpensively with the expectation that the buyer will reframe the work to suit their tastes. I had never considered that option, so for me, framing began as a necessity. Furthermore, because the work inside the frame is so delicate the idea of a buyer or framer handling it is an upsetting notion. Through the years the necessity has stayed the same, but the process has become so essential to the work itself that I don’t consider a piece finished until it is backed, matted, framed, and the brown paper sealed on the back. The framing process can often be the most difficult, but it can also certainly be the most rewarding as it’s all that stands between a stand-out piece and one that stays in flat file on show day. I typically maintain that unless there is a flaw in the selection or finishing process, there is a lid for every pot when it comes to selling. I’ve said before, and it’s true, I’m more concerned with achieving a positive reaction than a sale. If people seem to love a piece, but it appears in show after show, I’m rarely concerned. I love to show the work, and if it takes years for the right person to see it; so be it. Glow (the mason jar below) is backed over a beautiful hand-made metallic paper. It has a strong shimmer and I felt it stood out more on simple backing surrounded by a simple, shabby-chic frame. Three shows later, my mom convinced me that contrary to it’s name, it looked dull, and that sometimes, “shabby-chic,” is just shabby. Glow was re-backed with a muted gold/silver patterned paper, hugged by a black mat to accentuate the lid detail, and finished off with an unusual vintage frame that is true to the name of the piece. Keepsake is a beautiful cutting that was unnamed and unceremoniously framed in an inexpensive black frame to “get it on the wall,” of a previous show. It’s very simple, but very lovely and because I’ve passed the point where I accept tchotchke frames, I reimagined it. So much like a bunch of vintage pressed flowers, a keepsake from a memorable moment, it is perfectly surrounded in a “locket” made from black-cored white mat with an oval opening. The gold frame gives it a classic quality. The Carousel was a re-frame trifecta. First of all, my mom disliked its original frame from day one. She thought it was of poor quality (I disagreed), and that it wasn’t big enough for the piece and therefore made it look cramped. I loved the frame, but as is typical of me, I hand painted the background without measuring the dimensions, hence the black top and and bottom where the paper wasn’t long enough. I convinced myself that I liked the unfinished look of the paper and moved right along. So, (1) my mom wore me down, and once I thought more about it I realized the frame, while strong, wasn’t up to my standards (2), and the size and layout just bugged me (3). We found a gorgeous molding from Merion Art & Repro, had it built, had a wide white mat cut to put the focus on the cutting, and voila: A delight for the eyes.